NEW PRODUCT - Introductory Price. Large full color screen, graphing display, 88 combinations of metals and hardness scales, user definable hardness scales and metals, display modes for histogram, graph, smart, average, deviation etc. Ruggedized case with rubber bumpers. 1 year warranty on probe and tester. Surface finish equivalent to 80 grind or better. Induction or carburized machined parts, e.g.. camshafts, turbines, weld inspection, HAZ. Surface finish equivalent to 150 grind or better. metals with different properties from steel (for example, non-ferrous metals, alloys, etc.) with five additional scales for calibration; The device can be quickly and easily calibrated to a single specimen of known hardness ( for plus/minus testing ) or to a range of hardness from 2 specimens of the same material and of known upper and lower hardness values. The best is 3 sample specimens of the same material of different hardness. With 3 it is then possible to test through the whole range of hardness values of a material type. The unit has user calibration fields for Steel, Alloy Steel, Stainless Steel, non ferrous materials and several user definable fields. Each in Rockwell C, Brinell, Vickers, plus 2 custom fields for other scales. The tester is supplied with the UCI probe/s pre configured for Steel, using NIST traceable test blocks, in HRC and HB. 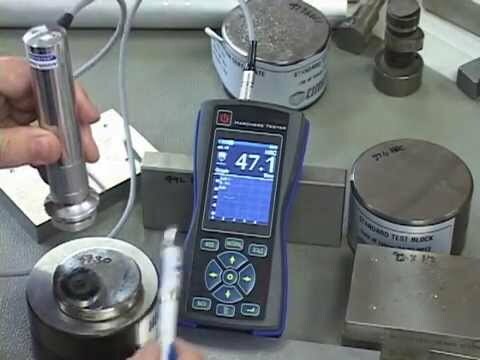 The tester can be finely calibrated to an exact material type e.g.. P20 or H13 but for most users the general calibration, in this case Alloy Steel is generally accepted. 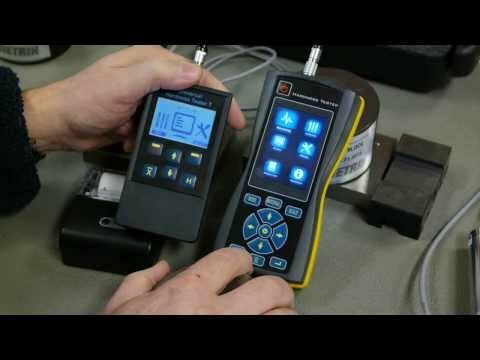 Because the tester can be calibrated to specific materials, that range of material classes and options is enormous and huge advantage of testers that have fixed material types. Materials Steel pre configured. 88 Calibration Scales of Hardness. Divided into 8 Scales and 11 materials for each. Hardness indication Backlit Color LCD display. Not specifically suited for measuring the hardness of products with a coarse-grained structure (e.g, cast iron), unheatreated aluminum, or other soft non ferrous materials or parts ( D type probe option can measure those materials ) weighing less than 10 grams (0.35oz), or less than 1 mm (0.04") thick. How to use the UCI test probe to get accurate results. Detailed instruction on calibrating the tester.